It’s not the week to say it, but Donald Trump has a point. It isn’t original and what it proposes will be hard to do, yet when he says that “getting along with Russia is a good thing,” as he did before his meeting with Russian President Vladimir Putin in Helsinki last month, he isn’t wrong. Russia isn’t a country whose enmity to the West should be shrugged off. Rather than copy its aggressive attitudes, democratic countries should remain vigilant and tough on its egregious moves on Ukraine and its intimidation of the NATO members in the Baltic states. But they should also try harder to promote cultural links, open debates with Russians of all opinions, promote educational exchanges and give platforms to Russian commentators, intellectuals and politicians. One of the many downsides of the fateful Hopeless in Helsinki dialogue was that it made Putin, in contrast to his American interlocutor, look good – potent, coherent, in command – something the Russian media stressed with evident relish. It sent the message out to the world that here was a Russian leader, re-elected president for the fourth time, and in power for a six-year term, who is unassailable – in charge of his program, his administration and his country. 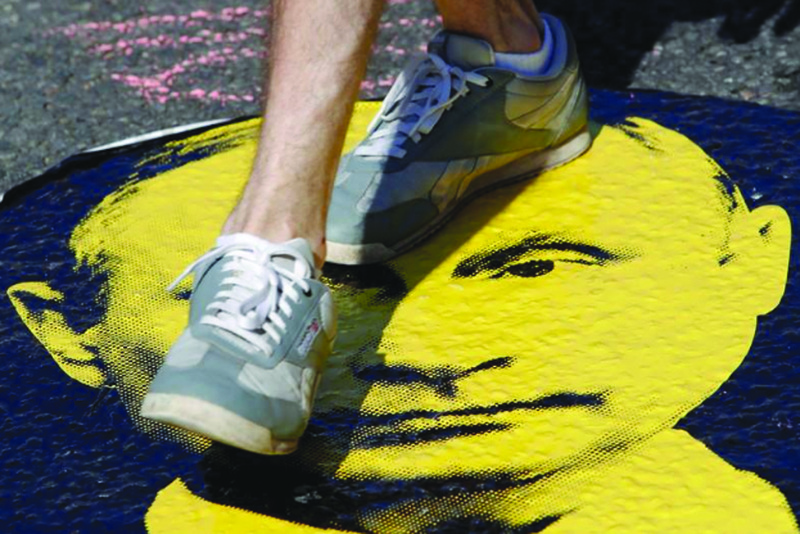 Putin’s domestic popularity has fallen sharply in recent months. In an August 12 poll by the Public Opinion Foundation, only 46 percent of those surveyed said they would vote for Putin if elections were held that week – down from 62 percent in June. Another poll by the independent Levada Center found that the number of Russians who thought the country was headed in the wrong direction rose from 27 percent in May to 40 percent in July; less than half (48 percent) thought things were going right. Those numbers may not be catastrophic by the standards of leaders in democratic countries, but they represent a sharp decline from the days when Putin’s approval ratings were well over 80 percent. The decline was attributed, mainly, to a government decision to raise the pension age from 55 to 63 for women and 60 to 65 for men breaking Putin’s 2005 pledge not to do so.In a country where life expectancy for men is only 66, this generated widespread resentment, especially from the older middle aged who have been largely faithful to him as leader. That this demographic should rebel – even if rather passively – is a sign that Putin has not, by his domestically-lauded moves of taking Crimea and supporting the separatists in Eastern Ukraine, exempted himself from the laws of public disillusionment. Even a controlled democracy like Russia’s leaves space for loyalists to defect; some polls showed that Putin’s personal approval rating dropped to 69 percent after plans for the change were announced.Putin remains firmly in control for now, but these trends show he may no longer be an unassailable figure, and may struggle in this presidential term.Were a forced resignation to be his fate, as his popularity deserts him and his Kremlin colleagues turn on him, then foreigners, especially in the West, would expect a massive change. Much commentary has posed Putin as so central to Russian polity that he at times appears to be synonymous with the country he leads: that he is Russia. There would be a post-Putin change. But it is unlikely to be massive. First, there is no united opposition or “government in waiting” – not from the unpopular liberal parties and groups, not from the communist and other parties who make up a flaccid opposition, not even from Alexei Navalny, the highest profile, most charismatic and boldest oppositionist, who has made high-level corruption his main theme.The West has been widely unpopular among Russians for some years. Putin did not create that sentiment, but he has stoked a perception of the West as dismissive of Russian values in its pushing NATO closer to the country’s borders and its promoting of sexual tolerance while Moscow uses homophobia as a political tool.